In large bowl, beat all ingredients except pecans with electric mixer on medium speed until well mixed. Stir in chopped pecans. Place dough on 14-inch length of plastic wrap. Use wrap to shape dough into 12x2-inch log. Wrap in plastic wrap; refrigerate at least 2 hours until firm. Heat oven to 375°F. Cut dough into 1/4-inch slices with sharp knife. On ungreased cookie sheet, place slices 1 inch apart. 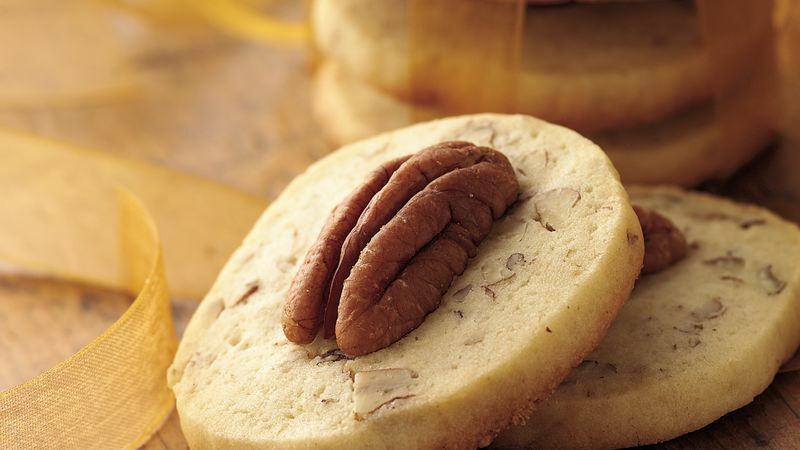 Press 1 pecan half on each cookie. Bake 8 to 10 minutes or until edges begin to brown. Cool 1 minute; remove from cookie sheet to cooling rack. Toast nuts in shallow pan in 350ºF oven 6 to 10 minutes, stirring occasionally, until light brown. Each time you slice a cookie, roll the roll of cookie dough a quarter turn to prevent flattening on one side. Cookie dough can be frozen for up to 9 months. To freeze refrigerator cookie dough, wrap rolls of dough in foil or freezerproof wrap.